You are here: Home / HockeyBlog / Hey Bernier, what’s up with that mask you were wearing? For those unfamiliar, Michel Lefevre is a legendary designer of equipment used by goaltenders. He originally produced items under the Lefevre brand and his stuff is now available through Koho – which is manufactured by CCM (who are owned by Reebok). Confused yet? Don’t worry, that’s not the story here. Those who attend Kings practices noticed Bernier’s new look right away last month, just as he returned to North America from playing in Germany during the NHL lockout. However, it wasn’t introduced to the masses until he replaced Jonathan Quick early in the first period on Saturday. Then, with the Anaheim Ducks buzzing all around him, Bernier’s new mask was now on full display. Unfortunately, it looked a little stale on the outside though because he hasn’t had it properly painted up yet. Inside though, it’s far from boring. For anybody who’s watched Bernier in practice the last few seasons you may have also noticed he wore a plastic neck guard below his mask – only in practice though, not during games. Well, that’s a thing of the past too. With his new helmet, it’s not needed. “Because this mask is a little longer I feel I have a little more security,” he said. For now, he’s put a few stickers on the otherwise white mask. 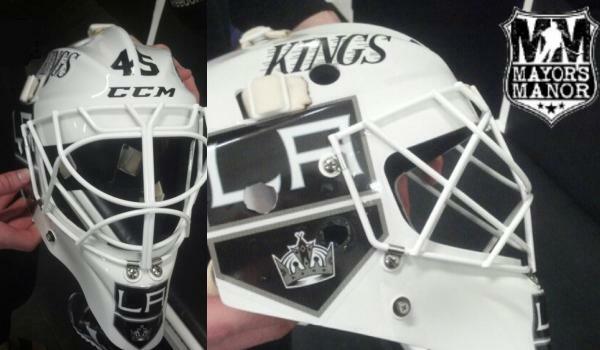 However, even with some LA Kings logos applied to the shell it’s just not what people have come to expect from his mask designs. When he does finally get a chance to show off an all new look, there’s one thing you won’t be seeing worked into the paint scheme – the Hollywood sign. The iconic logo he’s used several times over the past few seasons is now a thing of the past. “I just didn’t want to go that route again,” Bernier stated. You may recall, last season Bernier, the Kings and representatives of the Hollywood sign were nearly entangled in a legal battle – something former Kings’ goalie Kelly Hrudey thought was completely ridiculous. Like most things, Bernier continues to take life in stride. No problems, no worries. Just want you want in a goaltender – calm, cool, collected. THINK IT HAS GREAT POTENTIAL! QUICK IS GOING ARMOUR, KNIGHT.. ETC… THEME… MAYBE BERNIE SHOULD GO SPACE, FUTURISTIC, MINIMAL..EVEN LIKE A DEATH-STAR MASK HELMET LOOK! I like the mask how it is. It has a “part of the team” feel to it since it just resembles a skater’s helmet. Tell him not to change it. I was digging it the way it is along with a lot of my buddies. It has a simple old school look to it. I actually love the way it looks! Simple, bright, clean. I like the mask the way it is pictured. It is minimalist and it jumps out at you. Leave it exactly the way it is in that picture. It is different and definitely eye catching.